Nestled in a quiet cul-de-sac, This property backs up to a secluded mountain preserve and park with breathtaking mountain views in an upscale Mesa location. Master bedroom suite boasts cathedral ceilings, king size bed , a large Roman tub with a private balcony overlooking the pool. Multiple king size beds in this spacious home complete with all appliances and fully furnished. The property has a 3 car garage and room on the side of the house for an RV. Some other amenities included with the property are , private heated pool, fireplace, pool table, misting system, outdoor fire pit, netflix , premium cable package , and high speed Internet..to name a few LOCATION, LOCATION, LOCATION!!! 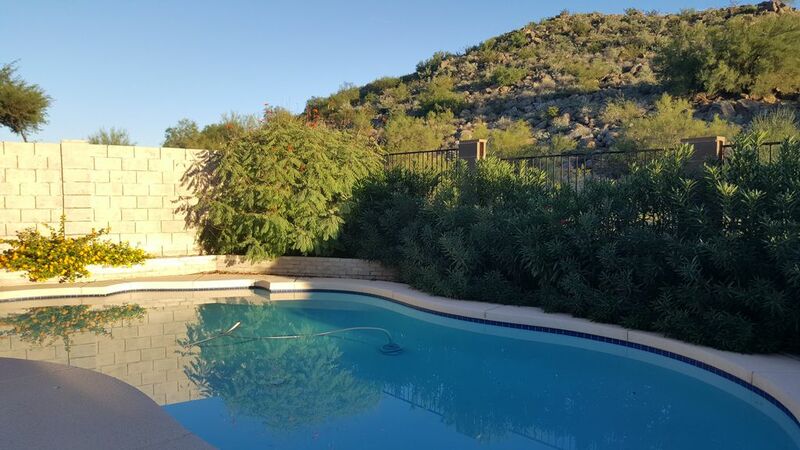 This is a great vacation home 25 minutes from Sky Harbor Airport , Major league spring training, golf courses galore and can't get any closer to the lakes. IMPORTANT NOTE: We do not accept children under 8 because there is no fense around the pool. -The property shall not be used by more than the number of adults and children listed in your reservation. -All guests shall not engage in illegal activity. -Pet policy – Please contact owner. -The responsible renter must be at least 25 years of age. -Guests under 25 years of age are welcome, but must be accompanied by a parent or legal guardian. -Smoking is permitted only in patio areas outside. -No commercial photography or filming is permitted on the property. -Renter is liable for any damage to the property and agrees to accept charges to the card on file should damage occur during occupancy. **A breach of any of the above terms may result in a forfeiture of your rights regarding this rental property, including eviction from the premises without refund. **Please note we do not accept children below the age of 8 due to pool safety. Hello, I am Barbara. This is my property and my goal is for you to have a wonderful vacation. I have been involved With vacation rentals for awhlie now and I try hard to make the property filled with things you may need .I really enjoy what I do. Ive had wonderful people stay over the years and made alot of friends . .. Feel free to look at my reviews for a customer’s account on their stay at my property. No matter where you end up booking, Please Have A Great Trip! This is a beautiful home on the base of a hill in beautiful East Mesa. If you are interested in golf then look no further. There are numerous golf courses within a few miles including Las Sendas, Longbow, Painted Mountain and Red Mountain. If you are one for the outdoors various lakes including Saguaro and rivers like the great salt are less than 10 miles from this residence. Spring training is also an exciting time in March with over ten teams playing ball throughout the valley. If you are one for a little fun there are also multiple casinos throughout the valley including Fort McDowell and Casino Arizona. Arizona and East Mesa specifically is home to incredible weather year round which is the perfect escape from the winter cold. There are three bathrooms all all of which have baths and showers. The master bath has a large roman tub, vaulted ceilings and mountain views. Driveway is huge and comes with a 3 car garage and rv parking. Boats are welcome, bring all your toys! please let us know if you have a specific program you have to have ,possibly in advance so we can get that taken care of for ya . The house was big and roomy-kitchen well stocked with dishes and appliances. A door between the master bedroom and bath would be nice because of the extra bed in that room. The pool area was nice and clean. The host, Barbara, was very responsive and great to work with. She generously left us a huge bowl of fresh fruit that we really appreciated! There were all kinds of things like laundry soap, coffee, tea, seasonings, shower gel, shampoo, etc. at the house so we didn’t need to stock up. The house had plenty of room for all 8 of us. The 6th bedroom wasn’t actually a true bedroom. It’s a large sitting room off the master (no door between it and the master bedroom), but it had plenty of space and had its own closets. The master bathroom was very large but it also didn’t have a door to the bedroom. Fortunately, all of us who shared this bathroom had traveled together so we weren’t bothered by this. The pool was great—even had beach towels. We enjoyed having breakfast out by the pool. And it was fun that there was a pool table in one of the living areas. The house could use a bit of updating but that should not be a deterrent. It was clean and spacious and definitely met all of our needs for the week. They had everthing there, we didn't need to bring anything. It was such a nice house. All of my family loved it! As advertised! Great VRBO experience. Brought family out for a wedding and it was perfect for us. The home was clean and well stocked with towels and dishes for our 14 family members. Barbara was extremely responsive to any inquiry and the check in and out process was too easy. Nice neighborhood close to grocery, gas and restaurants. We highly recommend and would stay again. There was plenty of room for our family group of 11 to be together and yet enough private space as well. The kitchen is large enough to accommodate 2-3 helpers. Plenty of dishes and glasswear. It was a little too cool to enjoy the nice pool and backyard, but the pool table was a big hit. Beds were super comfy and linens and towels were clean and plentiful. Thank you Barbara for the added touches of Christmas decorations and fruit basket! Maximum Occupancy: 14 Guests* Monthly rental includes utilities. -------------------------------------------------------------------------------------------------------------------------------------------------------------------------------------- CONTRACT TERMS •	The property shall not be used by more than the number of adults and children listed in your reservation. •	All guests shall not engage in illegal activity. •	Pet policy – Please contact owner. •	The responsible renter must be at least 25 years of age. •	Smoking is permitted only in patio areas outside. •	No commercial photography or filming is permitted on the property. •	Renter is liable for any damage to the property and agrees to accept charges to card on file should damage occur during occupancy. A breach of any of the above terms may result in a forfeiture of your rights regarding this rental property, including eviction from the premises without refund.